I was born on July 25, 2006 in Ormstown, Quebec, the son of China and Zeus. It was my human brother Daniel who chose me from a litter of three girls - and a boy - me! 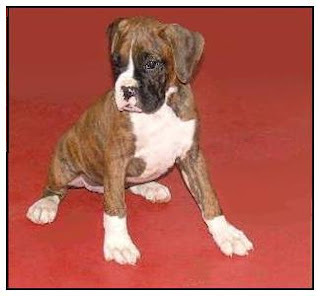 When Daniel and Papa came to my breeder, Barry's house to choose one of us, I could tell how much they liked Boxers and I wanted Daniel to pick me. So to impress him, I started showing off and trying to bite off my sisters' ears. Daniel liked that I was frisky and he chose me! When he picked me up to give me that first hug, he said he was afraid he'd crush my bones because I was so small. He says that I was smaller than my head is now! The day came when I was ready to be picked up to go to my new home, and this time Mama came too. She scooped me right up and kissed me hello. She loved me the minute she saw me, and called me their precious puppy. During the car ride home, I was shaking and very scared, but Mama and Daniel took turns holding me and I calmed down enough to fall asleep in Mama's arms. Daniel had been wanting another dog ever since our third Cocker, Buffy, left us when Daniel was four. He was an only child and Mama wanted him to have a companion. When Daniel was five, she rescued our cat, Beauty. She was working full time then and didn't think it was right to have a dog. Daniel adored Beauty, but she wasn't his idea of a buddy. So Mama got Rugrat to keep Beauty company and figured she'd wait til she was working part-time to get a dog, which is what eventually happened. I spent my first nights sleeping in the den behind a gate. The den was converted into my very own room, at least until I was housebroken, but I was hardly ever alone there. Mama and Papa slept on the couch and took turns taking me outside every couple of hours. I'll never forget how surprised Mama was when she turned around in the kitchen one night and saw me standing there. I'd learned how to jump the gate by taking a flying leap and bouncing off the arm of the couch. She put me back in the den and closed the door, but I appeared in the kitchen again -- I figured out how to open the door! I just stood on the couch and pushed down on the handle, which was a lever. My family learned early on that I am a very funny dog. I do hilarious things every day. My family laughed hysterically the first time I kidney-beaned for them. They still do. When Boxers are happy to see you, they fold their bodies in half and lean into you. Sometimes when Mama comes home, I fold myself up and hop sideways across the room! I AM a clown! Obedience school was a challenge because I'd just as soon have chased Daisy, a Springer Spaniel who wore red ribbons on her ears, than learn to sit and stay. I embarrassed my family a lot at school because I was the silliest dog in the room. My family had plans to show me so I did lots of homework and I finally learned to concentrate. From day one, Papa took me to his office when Mama was working so I wouldn't be alone. I still go there regularly and am so happy there. There are other dogs there, including my favourite, a Golden Retriever named Max. I also run on the dock and visit people in their offices. I even deliver documents! I'm two years old now and very glad I came to live with Mama, Papa and Daniel. We love each other so much. I couldn't have asked for a more devoted family. Chef, you are so beautiful! We LOVE big dogs and you are not scary at all! Now, opened a door like that is very clever! I wonder what else you can do. Let us know when you album is out! We want to be the first to buy it!